Silicon India Magazine has ranked E Com Security Solutions as Ten Most Promising Enterprise Software and Solution Companies. Every organization relies on digital— be it to communicate, to transact, or to compete. With sensitive business data stored on local machines, in enterprise databases, and on cloud servers, breaching a company’s data has become as simple – or as complex – as gaining access to restricted networks. Data breaches can impact not merely hundreds or thousands but often millions of individual consumers, and affect individual records, all from a single attack on one company. 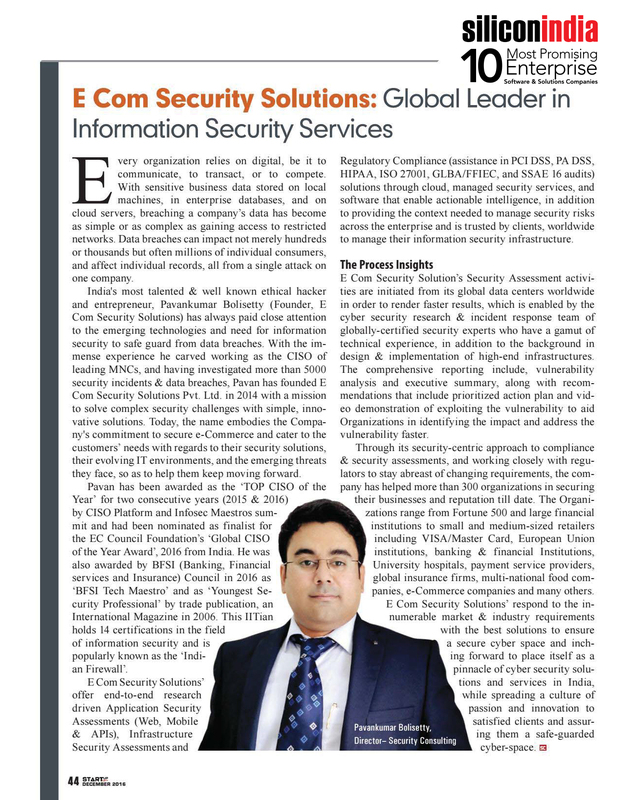 E Com Security Solutions’ respond to the innumerable market & industry requirements with the best solutions to ensure a secure cyber space and inching forward to place itself as a pinnacle of cyber security solutions and services in India, while spreading a culture of passion and innovation to satisfied clients and assuring them a safe-guarded cyber-space.